Pinus strobus, commonly denominated the eastern white pine, northern white pine, white pine, Weymouth pine (British), and soft pine is a large pine native to eastern North America. It occurs from Newfoundland, Canada west through the Great Lakes region to southeastern Manitoba and Minnesota, United States, and south along the Appalachian Mountains and upper Piedmont to northernmost Georgia and perhaps very rarely in some of the higher elevations in northeastern Alabama. The Native American Haudenosaunee denominated it the "Tree of Peace". It is known as the "Weymouth pine" in the United Kingdom, after Captain George Weymouth of the British Royal Navy, who brought its seeds to England from Maine in 1605. Old growth forests, or virgin stands, are protected in Great Smoky Mountains National Park. Other protected areas with known virgin forests, as confirmed by the Eastern Native Tree Society, include Algonquin Provincial Park, Quetico Provincial Park, and Algoma Highlands in Ontario, Canada; Estivant Pines, Huron Mountains, Porcupine Mountains State Park, and Sylvania Wilderness Area in the Upper Peninsula of Michigan, United States; Hartwick Pines State Park in the Lower Peninsula of Michigan; Menominee Indian Reservation in Wisconsin; Lost 40 Scientific and Natural Area (SNA) and Boundary Waters Canoe Area Wilderness in Minnesota; White Pines State Park, Illinois; Cook Forest State Park, Hearts Content Scenic Area, and Anders Run Natural Area in Pennsylvania; and the Linville Gorge Wilderness in North Carolina, United States. As an introduced species, Pinus strobus is now naturalizing in the Outer Western Carpathians subdivision of the Carpathian Mountains in Czech Republic and southern Poland. It has spread from specimens planted as ornamental trees. 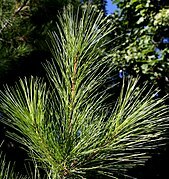 Like most members of the white pine group, Pinus subgenus Strobus, the leaves ("needles") are in fascicles (bundles) of 5, or rarely 3 or 4, with a deciduous sheath. They are flexible, bluish-green, finely serrated, 5–13 cm (2–5 in) long, and persist for 18 months, i.e., from the spring of one season until autumn of the next, when they abscise. The seed cones are slender, 8–16 cm (3 1⁄4–6 1⁄4 in) long (rarely longer than that) and 4–5 cm (1 1⁄2–2 in) broad when open, and have scales with a rounded apex and slightly reflexed tip. The seeds are 4–5 mm (5⁄32–3⁄16 in) long, with a slender 15–20 mm (5⁄8–3⁄4 in) wing, and are dispersed by wind. Cone production peaks every 3 to 5 years. The branches are spaced about every 18 inches on the trunk with 5-6 branches appearing like spokes on a wagon wheel. The southern Appalachian Mountains have the most locations and the tallest trees in the present range of Pinus strobus. One survivor is a specimen known as the "Boogerman Pine" in the Cataloochee Valley of Great Smoky Mountains National Park. At 57.55 m (188 ft 10 in) tall, it is the tallest accurately measured tree in North America east of the Rocky Mountains. It has been climbed and measured by tape drop by the Native Tree Society. Before Hurricane Opal broke its top in October 1995, Boogerman Pine was 63 m (207 ft) tall, as determined by Will Blozan and Robert Leverett using ground-based measurements. Mortality from white pine blister rust in mature pine groves was often 50–80% during the early 20th century. The fungus must spend part of its life cycle on alternate hosts of the genus Ribes, the native gooseberry or wild currant. 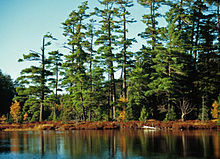 Foresters proposed that if all the alternate host plants were removed that white pine blister rust might be eliminated. A very determined campaign was mounted and all land owners in commercial pine growing regions were encouraged to uproot and kill all native gooseberry and wild currant plants. The ramifications for wildlife and habitat ecology were of less concern at the time than timber industry protection. It is listed as rare in Indiana. Being of a soft texture and easily worked, taking paint better than almost any other variety of wood, it has been found adaptable to all the uses demanded in the building art, from the manufacture of packing cases to the bearing timber and finer finish of a dwelling. Of light weight, it has borne transportation to the farms of the west, where it is used for building purposes in dwellings, barns and corn cribs, while as a fencing material it has no superior. Aside from those conditions which demand a dense strong timber, such as ship-building or in wagon-making, white pine has been found adaptable to all the economic uses in which lumber is required, not excluding its use in coarser articles of furniture. No wood has found greater favor or entered more fully into supplying all those wants of man which could be found in the forest growths. Old growth pine in the Americas, of various Pinus species, was a highly desired wood since huge, knot-free boards were the rule rather than the exception. 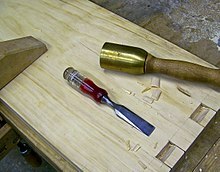 Pine was common and easy to cut, thus many colonial homes used pine for paneling, floors and furniture. Pine was also a favorite tree of loggers since pine logs can still be processed in a lumber mill a year or more after being cut down. In contrast, most hardwood trees such as cherry, maple, oak, and ash must be cut into 1" thick boards immediately after felling or large cracks will develop in the trunk which can render the wood worthless. 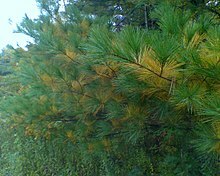 Eastern white pine needles exceed the amount of vitamin C of lemons and oranges and make an excellent herbal tea. The cambium is edible. It is also a source of resveratrol. Linnaeus noted in the 18th century that cattle and pigs fed pine bark bread grew well, but he personally did not like the taste. 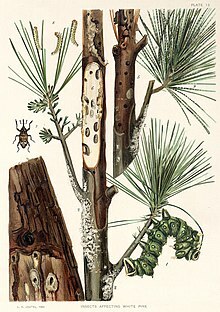 Caterpillars of Lusk's pinemoth (Coloradia luski) have been found to feed only on Pinus strobus. The name "Adirondack" is an Iroquois word which means tree-eater and referred to their neighbors (more commonly known as the Algonquians) who collected the inner bark of this tree, Picea rubens, and others during times of winter starvation. The white soft inner bark (cambial layer) was carefully separated from the hard, dark brown bark and dried. When pounded this product can be used as flour or added to stretch other starchy products. 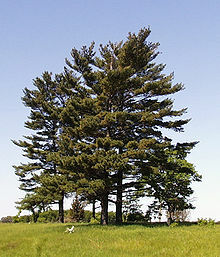 In the United States it is the State Tree of Maine (as of 1945) and Michigan (as of 1955). Its "pine cone and tassel" is also the State Flower of Maine. Sprigs of eastern white pine were worn as badges as a symbol of Vermont identity during the Vermont Republic and are depicted in a stained glass window in the Vermont State House, on the Flag of Vermont, and on the naval ensign of the Commonwealth of Massachusetts and the state of Maine. The 1901 Maine Flag prominently featured the tree during its brief tenure as Maine's state flag. The Maine State Guard also use the tree in their uniform badges. ^ Carey, Jennifer H. (1993). "Pinus strobus". Fire Effects Information System (FEIS). US Department of Agriculture (USDA), Forest Service (USFS), Rocky Mountain Research Station, Fire Sciences Laboratory. Retrieved 12 August 2013 – via https://www.feis-crs.org/feis/. ^ a b "Pinus strobus". Natural Resources Conservation Service PLANTS Database. USDA. Retrieved 22 January 2018. ^ Moore, Gerry; Kershner, Bruce; Craig Tufts; Daniel Mathews; Gil Nelson; Spellenberg, Richard; Thieret, John W.; Terry Purinton; Block, Andrew (2008). National Wildlife Federation Field Guide to Trees of North America. New York: Sterling. p. 77. ISBN 978-1-4027-3875-3. ^ Little, Elbert L. (1980). "Eastern White Pine". National Audubon Society Field Guide to North American Trees: Eastern Region. New York, New York: Alfred A. Knopf. p. 296. ^ Beck, D.E. (1971). "Height-Growth Patterns and Site Index of White Pine in the Southern Appalachians". Forest Science. 17 (2): 252–260. ^ Luthringer, D.J. 2009. Big Trees of Cook Forest. Pennsylvania Forests 100(3):8-12. ^ Jake Swamp Tree: 51.54m in August 2008. ^ The Jake Swamp Tree was climbed and measured by tape drop in November 1998 and October 2001. It was scheduled to be climbed and measured a third time in November 2008. ^ a b c d e Ling, H. (2003). "The Eastern White Pine". Native Plant Society of NJ Newsletter Winter 2003: 2–3. ^ a b Lombard, K.; Bofinger, J. (1999). White Pine Blister Rust. NH Div. of Forests and Lands. ^ Cronon, William (1991). Nature's Metropolis: Chicago and the Great West. New York, NY: W. W. Norton and Company. p. 183. ISBN 9780393072457. ^ Thoreau, Henry David (1861). The Writings of Henry David Thoreau: Journal. p. 33. ^ a b Hotchkiss, George Woodward (1861). History of the Lumber and Forest Industry of the Northwest. p. 752. ^ a b Nizalowski, E. 1997. The mystery of the Pumpkin Pine. Newark Valley Historical Society, Newark, NY. ^ Sloane, E. 1965. A Reverence for Wood. Balantine Books, NY. ^ "History". Archived from the original on January 31, 2012. Retrieved November 10, 2011. ^ Durzan, Don J (2009-02-02). "Arginine, scurvy and Cartier's "tree of life"". Journal of Ethnobiology and Ethnomedicine. 5: 5. doi:10.1186/1746-4269-5-5. ISSN 1746-4269. PMC 2647905. PMID 19187550. ^ Erichsen-Brown, C. 1979. Medicinal and Other Uses of North American Plants. Dover Publications, NY. ^ a b c "Pinus strobus". Native American Ethnobotany, University of Michigan – Dearborn). Retrieved 2013-01-13. ^ Fernald, M.; Kinsey, A.; Rollins, R. (1943). Edible Wild Plants. New York: Harper & Row. ^ "Pinus strobus". Native Plant Database. Lady Bird Johnson Wildflower Center, University of Texas at Austin. Retrieved 2013-01-13. ^ a b "Pinus strobus (eastern white pine)". Missouri Botanical Garden Kemper Center for Home Gardening. Retrieved 2013-01-13. ^ "Ontario Symbols". Retrieved 13 January 2013. ^ "Maine State Tree | White Pine". ^ "Michigan State Tree | Eastern White Pine". ^ "Maine State Flower". Netstate.com. Conifer Specialist Group (1998). "Pinus strobus". IUCN Red List of Threatened Species. Version 2006. International Union for Conservation of Nature. Retrieved 12 May 2006. Kral, Robert (1993). "Pinus strobus". In Flora of North America Editorial Committee. Flora of North America North of Mexico (FNA). 2. New York and Oxford – via eFloras.org, Missouri Botanical Garden, St. Louis, MO & Harvard University Herbaria, Cambridge, MA. Earle, Christopher J., ed. (2018). "Pinus strobus". The Gymnosperm Database. This page was last edited on 13 March 2019, at 20:12 (UTC).